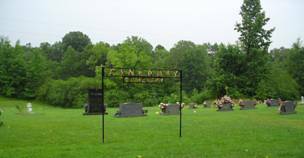 The Canerday Cemetery is located on County Road #73, off County Road #47. 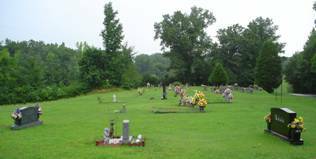 To reach the cemetery, turn north off Highway #133 (Cox Creek Parkway) in Florence and travel approximately 8.3 miles. Turn left onto County Road #73 and keep right. Travel .8 mile to the cemetery on the right. The are a few graves marked with fieldstones and one, more recent grave with no information. Enumerated by David & Martha Montgomery on March 9, 2009.
son of W.E. & M.E. Coker, A.D.; b. 14 Dec 1922, d. 22 Oct 1923, son of A.S. & A.M.
Gooch, infant; b. 15 Apr 1933, d. 16 Apr 1933, son of Mr. & Mrs.
Hammond, Annette M.; b. 24 Jan 1936, d. 16 Sep 2009, wife of Jesse W.
Jenkins, J.E. ; b. 16 Feb 1903, d. 16 Feb 1909, son of J.W. & E.E. Jones, Augazell; b. 04 Nov 1929, d. 28 Oct 1934, daughter of A.S. & E.E. Jones, J.B.; 04 Apr 1928, infant son of A.S. & E.E. LeFan, Fannie; b. 10 Jul 1893, d. 27 Jul 1921, wife of C.T. Lester, Harry; b. 24 Aug 1918, d. 08 Aug 1936, son of C.E. & G.P. Townsend, Eula Mae; b. 07 May 1919, d. 25 Oct 2016, wife of Willard K.